Many Private Events Children & Adults too ;), Large Company Events, Stadiums, and private photo shoots. I am multitalented and love art mostly gospel grafitti. I've been drawing since elementary school. My training is hands on with countless hours of videos, books and practicing on my 4 Children. I've done ministry work for many churches. I am a proud member of International Facepainters and Facepainting Forum online. I have entered many contest and have been featured on Illusion Magazines Contests. I have a total of 5 Year Experience operating as a face and body artist. What advice do you have for a person looking to hire a facepainter? #1 always look at their testimonials #2 Hygene is very important make sure you hire someone that has clean paints and paints are not purchased at a local store. #3 What types of Events have they done #4 Always look at their work beforehand a picture can tell alot. What does Victoria do on her spare time? She is currently back in school to pursue a career in Christian Counseling to help troubled teens. She is a Youth minister at Freelife Chapel at the present time. Also a registered Juvenile Detention Chaplain for Faith Community. She is a community volunteer and loves to serve urban outreaches. Is she experienced with Children? She has painted countless children and 4 of her own which she practices on. She has taught bible study and camp in the past with a large setting. She has patience with small children through teens. What kind of design can SweetCreationz Paint? How Many Faces Can SweetCreationz Paint? No.... I do not entertain like a clown, but dress up colorfully and paint my own face. Will SweetCreation paint my 6 month old baby? Absolutely NOT! No child under the age of 3 years old will be face painted. This is a sefety issue to protect your child. ***On the very young, I suggest getting the decoration on the arms or hands so they can see it. I do this all the time with my 2 year old. What do I need to provide for SweetCreationz? Absolutely nothing she provides 2 chairs and a table. How can I remove the paint? The facepaints will wash off easily with soap and water. Cleansing creams and cold cream work even better. How can I remove the glitter tattoos and how long do they last? With a small rag add some alcohol and rub slowly. These will last 1 week even in water. How long and how can I remove regular temp tattoos? Can last about 3days. Can be removed with Vaseline or a soft scrub. 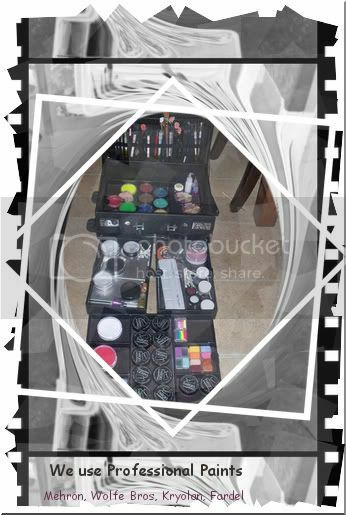 What is the Cost for SweetCreationz Facepainting? It depends on the package driving distance contact us for rates. What form of payment does SweetCreationz Accept? Deposits: PAYPAL or Check for Deposit. Full Balance Owed : Cash at the end of event.